The dependable performance of our Model D Indoor Rower has made it the best-selling indoor rower in the world. Recognized by competitive rowers as the standard for indoor training, the Model D delivers an effective cardiovascular workout that will increase your fitness level and tone your physique. At a fraction of the cost of other home fitness equipment or a yearly gym membership, you can have the luxury of working out in your home whenever you choose…and get a great workout to boot. Concept2 values practical design: The Model D is efficiently engineered and will last a lifetime. The Model D you buy is the same machine used by Olympic- and elite-level athletes to train for their sport — it’ll take the abuse of heavy training day after day. Every Model D includes a Performance Monitor that suits your needs and interests while giving you accurate, comparable data for every row. The adjustable monitor arm lets you position the monitor where you prefer. 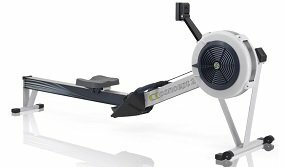 Concept2’s indoor rowers respond to your effort on every stroke, so you are in full control of your exertion and resistance at all times. The spiral damper allows you to easily adjust the airflow to the flywheel, so you can change the feel of the stroke to suit your preference. The flywheel design minimizes noise while maximizing a smooth feel. With its 14” seat height, the Model D keeps a low profile. The Model D features a quick-release (no tools required) framelock mechanism, so you can easily separate the machine into two pieces for storage. Caster wheels on the front foot allow you to roll the fully-assembled machine into position. 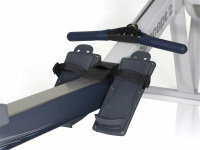 Concept2 uses adjustable footrests on indoor rowers for quick and easy sizing. (Footrests accommodate a wide range of shoe sizes.) The comfortable, ergonomic handle features a 10-degree bend that allows you to row with a natural arm and hand position. Nickel-plated chain: looks good and works hard. The nickel plating allows for longer periods between oiling, so, even if maintenance isn’t your strong suit, the Model D will still feel silky smooth during your next workout. The aluminum monorail is capped with a stainless-steel track to ensure a smooth, gliding seat movement. Concept2 machines are well known for their durability and construction. Tough and built to last, these machines withstand rigorous use in boat houses, training centers, living rooms, hotels, health clubs and military bases around the world. 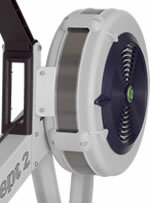 The Concept2 Slide (sold separately) adds an on-water feel to your Model D and allows you to connect multiple Model Cs, Ds and/or Es for team training. Monitor Arm: ABS plastic. Pivots for storage and to adjust monitor height and angle. Monorail Length: 54 in. Fits inseams up to 36 in. Extra-long monorail available at an additional cost. Contact Concept2 for more information.